“Behold, a virgin shall conceive, and bear a son, and shall call his name Immanuel” (Isaiah 7:14; cf. Matthew 1:22–23). Gabriel’s point was to show that Jesus was the long-anticipated Messiah, expected for centuries before he finally arrived. Recent research on early Israelite religion and belief has led some scholars to conclude that, indeed, some ancient Israelites believed in a Messiah-figure, who was the son of the Most High God and was prophesied to redeem Israel. But they didn’t seem to know exactly who this Messiah would be and when he would come onto the scene—or, at least, their prophecies did not include such details. Sometimes, they may not have even recognized the Messianic meaning in the signs and prophecies given to them. For example, Isaiah’s prophecy, cited in Matthew 1:22–23, originally given as a sign to the Israelite king Ahaz, appears to be about a child to be born later that same year as a sign that God will deliver Judah from its enemies in the 8th century BC (see Isaiah 7:10–16).1 But gospel writers like Matthew, with the hindsight of history and knowledge of the Savior’s mortal life and ministry, saw prophecies like this one as a type and shadow of the Messianic child to come. In contrast, Book of Mormon writers show a detailed awareness of Jesus Christ’s life and ministry from the very beginning, six hundred years before his coming (see 1 Nephi 10:4–10). Nearly a century before the angel Gabriel would deliver his message to Mary (see Luke 1:27–35), Alma revealed that the Messiah’s mother would be named Mary, and she’d be “a precious and chosen vessel, who shall be overshadowed and conceive by the power of the Holy Ghost” (Alma 7:10). And I beheld the city of Nazareth; and in the city of Nazareth I beheld a virgin, and she was exceedingly fair and white. And the angel said unto me: “Behold the Lamb of God, yea, even the Son of the Eternal Father!” (1 Nephi 11:13–21). Nephi’s guided vision, culminating with a virgin bearing a son identified as the Lamb of God, unmistakably refers to Jesus Christ. Nephi would later quote extensively from Isaiah, including the same prophecy Matthew cites, of “a virgin [who] shall conceive, and bear a son” (2 Nephi 17:14). Like the gospel writers, Nephi may have read Isaiah’s words and seen an unmistakable resemblance to his own vision about a forthcoming Messiah. 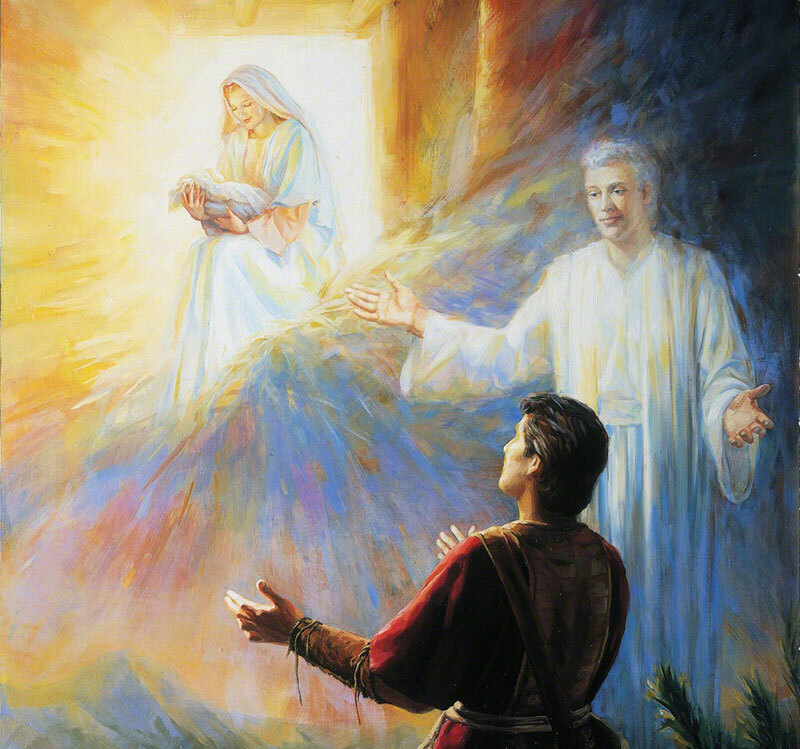 Today, as we reflect on the annunciation of Christ’s birth to Joseph and Mary, we have not only the benefit of hindsight, but also the clear Book of Mormon prophecies, as well as modern revelation, allowing us to clearly see that “all the holy prophets” testified of Christ’s coming (Jacob 4:4; cf. Acts 3:18, 24).